KIEV, Ukraine -- The Ukrainian Parliament finally voted to oust Ukraine’s odious prosecutor general, Viktor Shokin, on Tuesday. 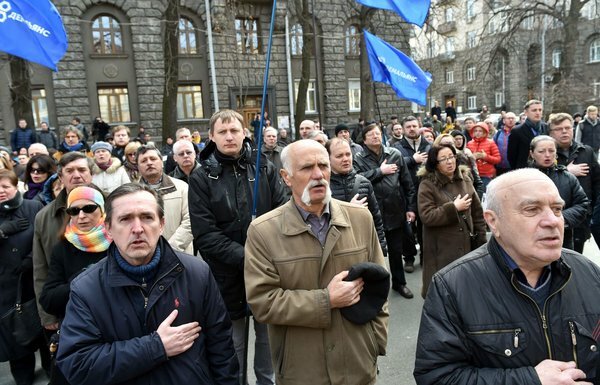 Ukrainians protested government corruption in Kiev on Monday. The United States and European countries that have provided aid to Ukraine had long pressed for his dismissal; in his year in office, Shokin became a symbol of Ukraine’s deeply ingrained culture of corruption, failing to prosecute a single member of the deposed Yanukovych regime or of the current government while blocking the efforts of reform-minded deputies. Alas, nothing is likely to change unless President Petro Poroshenko and Parliament agree to install some real corruption fighters and approve serious judicial reform. Corruption has been pervasive in Ukraine since independence, fed by close-knit ties between politicians and oligarchs and a weak justice system. The protests in 2014 that led to the removal of President Viktor Yanukovych were largely fueled by popular fury at his monumental corruption and abuse of power. Yet his overthrow has yet to show results. In a speech in Odessa last September, the United States ambassador, Geoffrey Pyatt, said corruption was as dangerous for Ukraine as was the Russian support for a military insurgency in eastern Ukraine. Among the examples Mr. Pyatt cited was the seizure in Britain of $23 million in illicit assets from the former Ukrainian ecology minister, Mykola Zlochevsky; Shokin’s office, however, declared that there was no case against the minister, and the money was released. In his last hours in office, Shokin dismissed the deputy prosecutor general, David Sakvarelidze, a former prosecutor in Georgia brought in by President Poroshenko to fight corruption. And before that, Shokin had systematically cleansed his office of reform-minded prosecutors. The acting prosecutor general now is Yuriy Sevruk, a crony who can be trusted to continue Shokin’s practices. Mr. Poroshenko, himself a product of the old system, has had his hands full with the Moscow-backed separatists in the east and unceasing political turmoil in Kiev, where Prime Minister Arseniy Yatsenyuk’s government is hanging by a thread. In these circumstances, Mr. Poroshenko seems to have accepted continuing corruption as the price to pay for a modicum of maneuvering room. But the president, the prime minister and the Parliament must be made to understand that the International Monetary Fund and donor nations, including the United States, cannot continue to shovel money into a corrupt swamp unless the government starts shaping the democratic rule that Ukrainians demanded in their protests. Mr. Poroshenko cannot simply allow one of Shokin’s cronies to slide into the ousted official’s tainted seat. He should immediately reinstate Mr. Sakvarelidze and begin a broad public discussion on the choice for the next prosecutor general, making clear that his mandate will be a thorough reform, and that the government will be fully behind it.